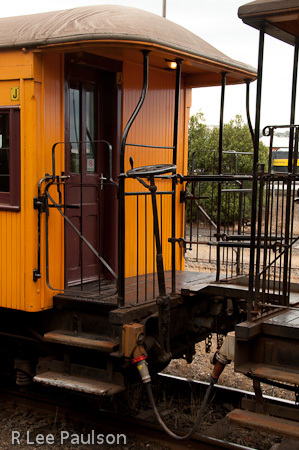 This train station is an important landmark and we were instructed to take many photos. I liked these columns. 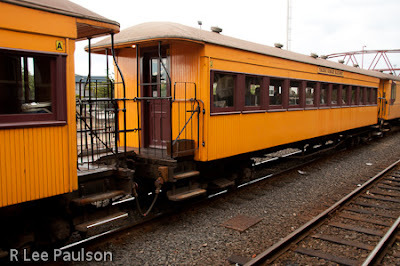 The trains were packed to overflowing with cruise ship passengers, much to the ire of the locals. I couldn't blame them. 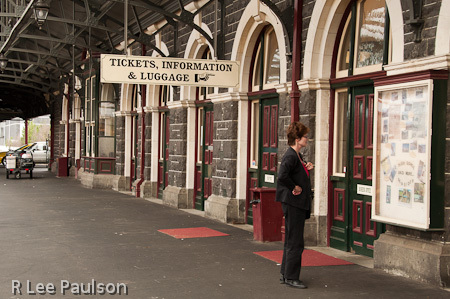 Dunedin has an urban population of 117,000, give or take. 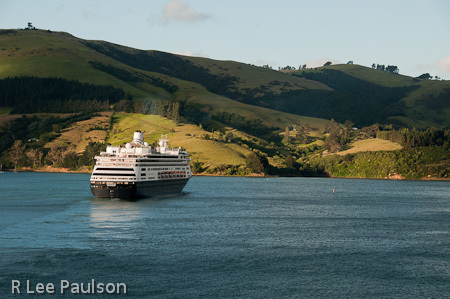 Two cruise ships carrying nearly 5,000 passengers were docked in Dunedin's port this day. The local tour operators were completely overwhelmed. Our bus driver had to drive two hours from an outlying town to do our tour because there simply were not enough buses to be had in Dunedin proper. He said it will get worse. 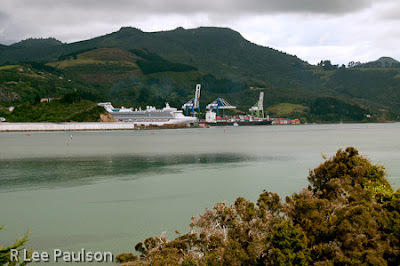 One day a few months down the road, three large cruise ships will dock on the same day. He said there simply weren't enough buses or tour guides in the nearby area to handle all the people. I purchased a refrigerator magnet with a sheep on it at the train station as a New Zealand souvenir. Melony said I couldn't use it until I actually saw a sheep there. 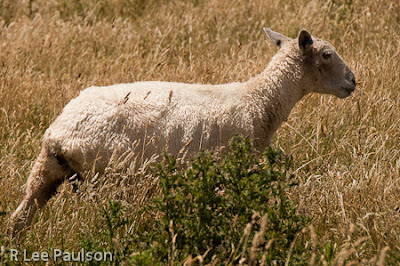 On the way back from Sea Beach we saw this sheep so I snapped its picture. 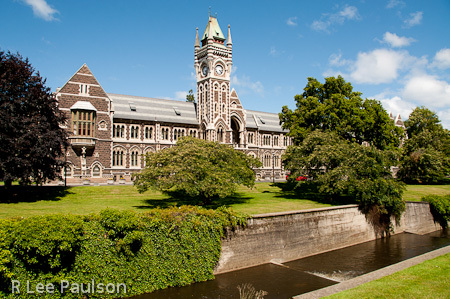 Also on the way back, we stopped of at the University of Otago in Dunedin, the oldest university in New Zealand. 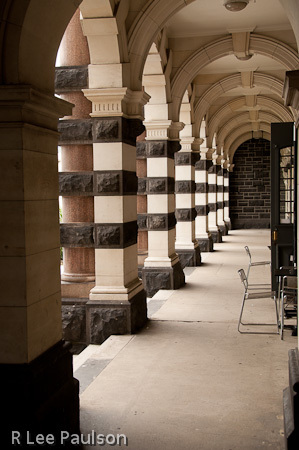 This is the original university building, completed in 1879. One would think the English settled this country. The "Water of Leith" runs in front. By the time we were back near the port, the skies had turned overcast again. Still, one has to admit the port setting is picturesque. Dunedin is also a working port. Piles of logs, the tip of one which can be seen here, were lined up down the pier. 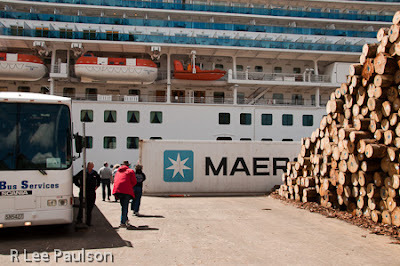 The container in front of the ship contained ship's supplies, which had been nearly loaded when we returned. 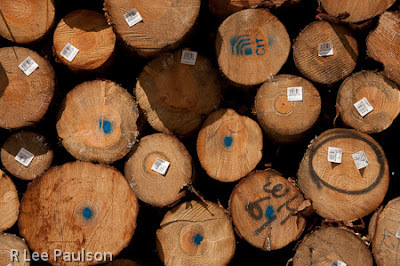 I couldn't resist taking an artsy shot of the logs. I had never realized before this that logs were an important export in New Zealand's economy. 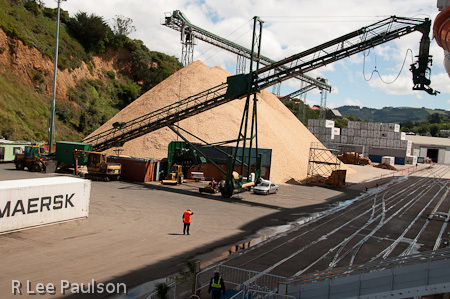 To the left of the logs, as one faced the ship, a huge pile of saw dust waited to be loaded on a ship for China. 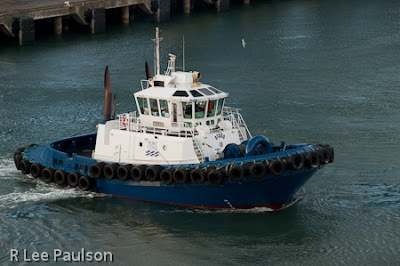 We saw these little blue tugs at every port where we stopped in New Zealand. They often did not do anything except keep a watchful eye out as we cast off. But, they were there in case they happened to be needed. By the time we were ready to leave that evening, the skies had cleared again. The Holland America ship, Volendam left before us, just as the sun was setting. I took this shot from our stateroom balcony. Next time, New Zealand's fiords. Continue on to Post 7: New Zealand's Fiords by clicking here.